Acorn™ offers a complete selection of Jung products for a variety of applications. Acorn™ also provides spare parts, accessories and operation manuals for every product. 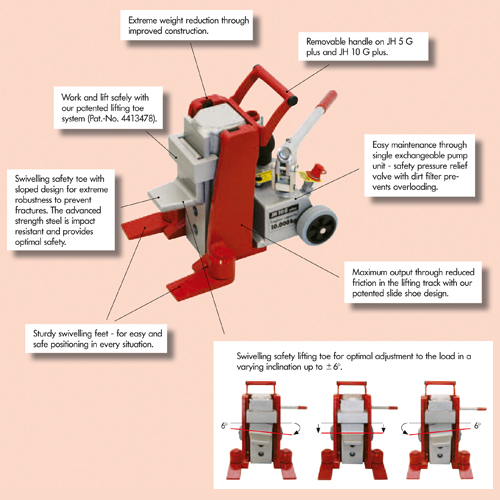 For an in-house demonstration on any product, Contact Acorn™. Spare Parts & Accessories are available for all Jung Products. Contact Acorn™ for assistance: 800-523-5474. • Reduced friction through slide shoes that are mobile in their seats. Under application a larger contact surface guarantees better force distribution. The resulting advantages are less friction, more power and reduced wear of the lifting track than with conventional jacks. • Reduced maintenance costs through easy to change slide shoes and exchangeable pump unit. • Extremely lightweight with high performance through the use of high-quality material and innovative design changes. • Continual adjustment to the load through swivelling safety toe. Secure stableness in every situation even in lifted position. • JH 10 G plus ku outfitted with dual side handles for positioning. • Standard carrying handle for JH 10 G plus ku available as optional accessory (Sparepart no. 91 106 260-B). • 180° revolving slide - for use with or without lifting feet. • High capacity at low weight for mobile use. • Separated pump unit, flexible use even in confined spaces, also in horizontal positions. • Swiveling lifting toe on JHS 10 ku assures optimal adjustment to the load, along with safe and stable support even in raised positions. • Convenient Push back / Transport cart will transport and retract jack effortlessly (includet JSET 30/50). • Job flexibility through separated lifting and pumping unit. •	Effortless transport and return to original position of jack through combined push back / transport unit (included JSET 30/50). •	Complete jack set includes all necessary hoses. Unpack and ready for use. • Sturdy construction, yet lightweight and easy to handle. • Pressure limiting valve provides safety against overloading. • Pumps are equipped with integrated quick-lift for faster working. • Quick connectors with drip free rapid closure valves. 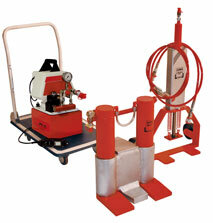 • One oil circuit capable of supplying two hydraulic jacks. • Maximum safety during operation through cable remote control. • Sturdy two stage electric pumps available in different versions. • Easily controllable: JPE 30-NVR now with precision lowering regulator. • Includes transport cart for easy and safe transport. pump type JPE 30 NVR or battery pump JPA 5. • Optional connecting bars on JKB 1 can be fixed without tools by clamping down on handle. • High load capacity at low weight. 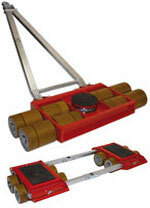 • Bearing supported swivelling rollers allow 360° maneuverability. • Same height trolleys provides interchangeability. Mix and match revolving trolleys JKB 1-4 with K-Series transport trolleys and JKB 5 with S-Series. 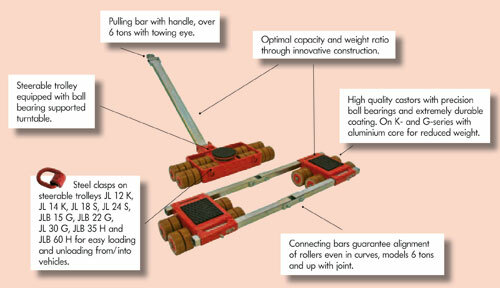 • Unrivalled: The double roller system on the JKB 3 up to JKB 5 reduces rolling and turning resistance to a minimum. • Using the slits in the platform the trolleys JKB 3-5 can be affixed to the load with standard tiedown belts. • In addition, the trolleys JKB 3-5 are outfitted with a platform center hole (Ø 1,2 inches) to allow attachement to the load. • Galvanized axles and safety clip rings for improved protection against corrosion. • Outfitted with highest quality rollers as standard. Reduced weight through advanced construction of load cassettes. • All transport trolleys are ready for use: The steerable transport trolley is fitted with a ball bearing supported turntable and a handlebar (as shown in picture). 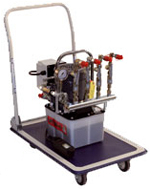 The adjustable-width transport trolley consists of two transport units and connecting rod. • Pivoting roller cassettes within the frame assure even pressure distribution across all rollers and across the floor. No need for complex and expensive hydraulic compensation system. • Low height at only 125 mm/4.9” with high capacity. • The double roller design results in dramatically easier steering due to reduced friction forces in curves. The much lower friction resistance also causes the rollers on the rear axis to follow in a truer course. • Easy set-up. Connect pneumatic hose and go. • No need for separate pulling vehicle. • Similar dimensions as dollies in the same series. • All hoses are detachable creating compact system for easy transport. • Capable of turning 180°. • No need for electric power cable. • Standard pneumatic connection 87 psi. • Unrivalled: Small and lightweight trolleys at super high capacity. • Reduced weight through advanced construction of frames. • All transport trolleys are ready for use: The steerable transport trolley is fitted with a ball bearing supported turntable and a handlebar (as shown in picture). The adjustable-width transport trolley consists of two transport units and connecting rods. Polyurethane and VULKOLLAN® rollers replaced by: JUWAthan+ rollers (see above) for higher durability and superior performance characteristics.